Always read the manufacturer instructions that come with the child restraint and the owner’s manual book that comes with the vehicle. In the owner’s manual, turn to the section(s) on safety belts and child safety seats (child restraints or car seats). Check your vehicle manual book for instructions on air bags. Some older vehicle manuals may have little or no information on safety seats or the manual may be missing. Contact the vehicle manufacturer for more information. Read labels on safety belts and safety seats. Check for air bag warning labels on the sun visor and/or on the front of the passenger door frame. Place the child restraint in the vehicle so that its base is resting flat on the vehicle seat cushion. If this is not possible, try another seating position or find a different child restraint that fits better. Babies under 2 YOA should face the rear of the vehicle in a child restraint that is designed for their height and weight. Babies must ride facing the rear even when they are out of the driver’s view in the back seat. Parents should feel just as comfortable in this situation as they do when they put their babies down for a nap and leave the room. If the baby has special health needs that require full-time monitoring, ask another adult to ride with the baby in the back seat and travel alone as little as possible. Be sure the rear-facing child restraint is reclined between 30d-45d, based on the angle indicator, based on the manufacturer instructions. A tightly rolled towel or a pool noodle may be used to help obtain correct angle. Older children (at about 2 YOA) face forward. If using a convertible seat, put it in the upright position so child is sitting up straight not reclined. The more upright position is preferred for safety. Emergency locking will lock only in a crash or sudden stop. It cannot hold a child safety seat on its own. Check the label on the belt or the vehicle owner’s book for further instructions. Automatic locking will lock whenever you stop pulling it out. It can hold a safety seat tightly. Take the slack out by pushing the webbing back into the retractor. Switchable works well with safety seats. It is an emergency locking retractor that switches to an automatic locking retractor. Check the label on the belt or the vehicle owner’s book on how to use this type. Pickup trucks with passenger airbags and no “shut-off” switch and no back seat cannot safely transport babies under 1 YOA. Babies this age must ride rear-facing and always in the back seat; the front may only be used if there is no danger from an airbag. If there is an airbag “shut-off” switch, read the pickup truck owner’s manual for instructions. Extended cab pickups with side-facing jump seats are NOT appropriate for children, or adults for that matter, to ride. Safety belts do not provide good protection in these seats. Child restraints CANNOT be installed in this spot. Extended cab pickups with rear bench seats may be appropriate. Check owners manual to verify what percentage of the child restraint that has to be on the vehicle seat. Make sure a rear-facing seat will fit when reclined at the appropriate level, according to the manufacturers instructions. Even when a forward-facing safety seat is installed tightly with the safety belt, a child’s head could hit the front seat in a crash. A tether strap is necessary to use if it is available on the seat and/or a top tether is located in the vehicle. Check the child restraint instructions and the vehicle owner’s manual. Never allow anyone to ride in the bed of a pickup. Riding this way can cause serious injury or death even if there is a shell or topper attached. It is also dangerous with a topper because carbon monoxide fumes can kill a person. The harness of a child restraint or the safety belt holds your child in the seat to keep him safe in a crash. It is important that they are used the right way and are snug on the strong parts of the child’s body. If the harness is loose, your child could be thrown out in a crash. The harness must lie flat on the child to safely spread the forces of a crash; do not allow the strap to become twisted. Always read the instructions that come with the child restraint. Use the infant child restraint until baby’s head comes within 1″ of the top of the shell or until baby has reached the upper weight limit. At that point, move into to the convertible seat. Use the convertible safety rear-facing seat until the child is 2 YOA or reaches the upper weight limit. Make sure the infant safety seat you use is approved for use in a motor vehicle. Check the labels and instructions. Babies must ride facing the rear – even when they are out of the driver’s view in the back seat. Parents should feel just as comfortable in this situation as they do when they put their babies down for a nap and leave the room. If the baby has special health needs that require full-time monitoring, ask another adult to ride with the baby in the back seat and travel alone as little as possible. Be sure the straps are threaded through the shell not just the pad and that they are in the at appropriate slot based on the direction that the baby is facing. Check the instructions. The harness must fit snugly on the baby’s shoulders and buckle between the legs. A snug harness is important; it holds the baby down in the child restraint during a crash. Correct harness tightness is when you CAN NOT pinch the harness between your fingers. Dress the baby in clothes that keep the legs free. If you want to cover the baby, buckle the harness first, adjust it for a snug fit, and then put a blanket over the baby. Avoid using bulky snow suits or buntings; they can make it hard to adjust the harness snugly. You want as little clothing material between the harness and your baby. The plastic harness retainer clip keeps the straps on baby’s shoulders. Make sure the clip is threaded correctly and that it is at armpit level. A new baby’s head will need support. To fill empty spaces and give support, tightly roll up a small towel or a receiving blanket and tuck them in on each side of your baby’s body and head. If the baby still slumps down, you may place a wash cloth between his legs behind the crotch strap. Always keep the handle on an infant carrier in the position that is directed by manufacturer instructions when the seat is in the vehicle. Use the convertible or forward-facing child restraint until the child outgrows it (when ears reach top of the seat, when shoulders reach the top slots, or when child reaches the upper weight limit). Then move to booster seat. Harness straps must always be at or above the child’s shoulders. Use the top harness strap slots on convertible seats. The top slots are reinforced to prevent the harness from breaking through in a crash. A few convertible seats have reinforcement that allows use of the center slot. Always check instructions before using anything but the top slot. The harness must fit snugly on the child’s shoulders and buckle between the legs. A snug harness is important because it keeps the child in the safety seat during a crash. Check if the harness is snug enough. It is when you are not able to pinch the harness away from the child shoulder’s. Make sure the harness will stay snug. Be sure the straps are threaded correctly through the shell not just the pad. Check the instructions. The plastic harness retainer clip keeps the straps on the child’s shoulders. Make sure the clip is threaded correctly and that it is at armpit level. Most children under eight are not big enough to fit the adult safety belt properly. A belt that rides up on the tummy can cause serious injury. A belt that is put under the arm or behind the back can also cause serious injury. Use a booster seat until the child reaches the upper weight limit of their child restraint or the child can sit comfortably in the vehicle seat without slouching. The lap belt needs to sit on the upper thigh area and the shoulder belt stays across the chest and shoulder. This usually will not happen until the child is between 8 and 12 years old, 80lbs–100lbs and is at the height of 4’9″. Make sure the booster you use is approved for use in a motor vehicle; check the labels and instructions. Booster seats that are designed for use at the dining table do NOT keep kids safe in a car crash. Use a belt-positioning booster ONLY with a lap/shoulder belt. It CAN NOT be use with a lap belt alone. If a child’s ears come above the top of the vehicle seat back, use a high back booster if possible. A lap and a shoulder belt must ALWAYS be used. Make sure your child knows how to sit properly in the vehicle without slouching. Make sure the lap belt sits on the upper thigh area and the shoulder belt crosses the chest and shoulder. Keep the belt snug. If no shoulder belt is available, best practice recommends that NO ONE sits in that seating position. A child restraint being seat buckled in is a good option for this spot due to the internal harness that is present. If the shoulder belt rubs against the side of the neck, it’s uncomfortable for the child and can be harmful in a crash. If he/she is inclined to place it behind his back or shoulder, that would be a good indicator that a booster seat is stil necessary. If the shoulder belt stays loose when it is pulled out, that too can be dangerous. Too much slack can cause serious injuries in a crash. Teach your child how to take up the slack by pulling on the shoulder belt to reset it. Never use pillows or books to raise a child to fit the belt. Using these will not keep the belt in the right place in a crash and could cause serious injury to a child. Never put a shoulder belt under a child’s arm or behind a child’s back. Doing this could cause serious internal injury in a crash. The lap belt of a lap and shoulder belt combination is not designed to work alone. Children who have outgrown safety seats are better protected by lap/shoulder belts than by lap belts alone. So, if several children are riding in the back and there are shoulder belts, let the older ones use the shoulder belts. Put the child riding in the child restraint in the middle where there is only a lap belt. 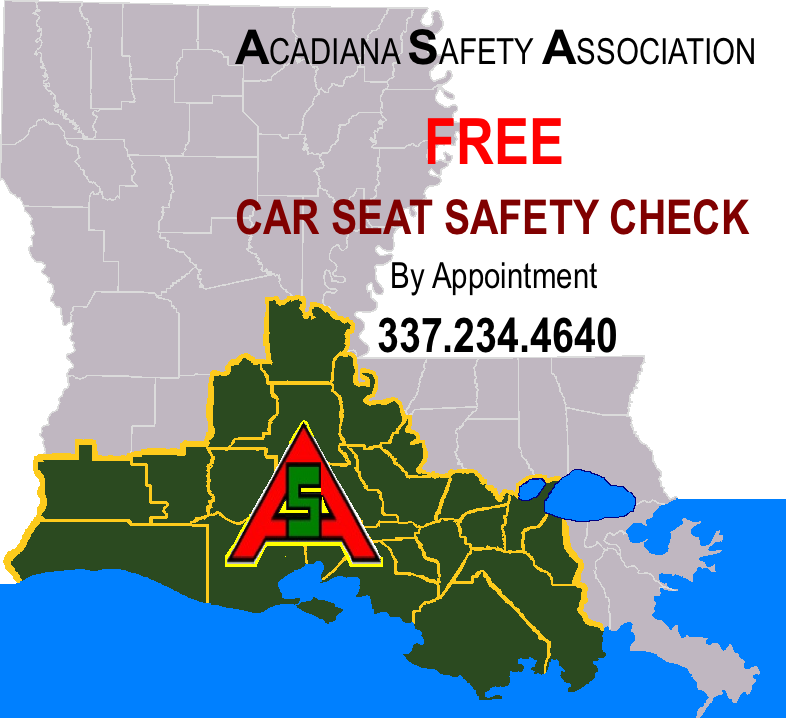 For further information or if you’d like to schedule an appointment with a certified Child Passenger Safety Technician/Instructor, please contact: Tracy LeMaire @ 337-288-9937. This is always a FREE SERVICE!! !